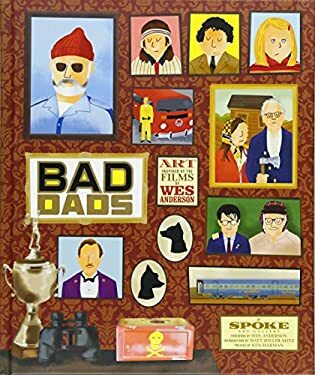 The third volume in the "New York Times "bestselling Wes Anderson Collection series showcases the best artwork from Bad Dads, an annual exhibition of art inspired by the films of Wes Anderson. Curated by Spoke Art Gallery in San Francisco, Bad Dads has continued to grow and progress as a dynamic group exhibition since its inaugural show in 2011, and has featured work from more than 400 artists from around the world. Those artworks range from paintings to sculptures to limited-edition screen prints and vary greatly in style, making for a diverse and lively show each year. Though each piece is distinct in its own right, the artworks unifying element is the shared imagery and beloved characters from: . "Bottle Rocket" . "Rushmore" . "The Royal Tenenbaums" . "The Life Aquatic with Steve Zissou" . "The Darjeeling Limited" . "Fantastic Mr. Fox" . "Moonrise Kingdom" . "The Grand Budapest Hotel" The book features an original cover by graphic artist Max Dalton, a foreword by writer and director Wes Anderson himself, and an introduction by TV and movie critic Matt Zoller Seitz, author of the bestselling Wes Anderson Collectionbooks. A visual treasure trove, "Bad Dads" grants fans of Wes Anderson another creative avenue to explore his inspired worlds and movies. Also available from Matt Zoller Seitz: "The Oliver Stone Experience," "Mad Men Carousel," "The Wes Anderson Collection: The Grand Budapest Hotel"," and ""The Wes Anderson Collection.""